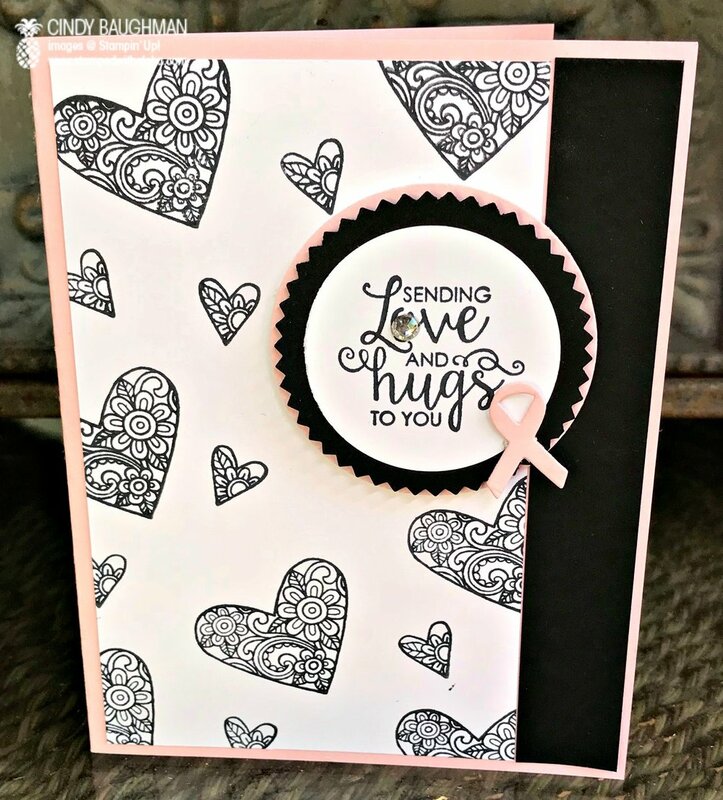 A year ago I shared a post on my blog called Pink Ribbon Cards. As you probably know, October is Breast Cancer Awareness month, and at that time I had just watched three very precious friends deal with the challenges that come from having breast cancer. Little did I know that just 6 months later, I too would be sitting in a doctors office receiving the same diagnosis. One of my survivor sisters said, "Gee, I know you're a supportive friend, but you didn't have to join the club". I was very fortunate that my cancer was non-invasive. So now just 6 months after surgery and radiation treatment I can say that I am officially cancer free. If you've followed my journey on my blog, you may remember that I was diagnosed at the same time I was beginning a remodel project in my stamp room. I see now that God had plans to "re-model" my life. Going through this battle I learned so much. I learned to appreciate family and friends more. I learned the importance of rest. I learned that the best way for me to deal with challenges is to give them to God and ask for His help, strength and wisdom. I learned that I was loved way more than I ever realized. I learned the importance of making time to demonstrate love, not only in words but in my actions. I witnessed that miracles are real and that even the most difficult challenges can work out to be blessings in disguise. I learned that difficulties help you to grow and can make you stronger. I realized that I am very, very fortunate and extremely blessed. So it is with a heart of gratitude that I plan to officially dedicate and reopen my new stamp studio next weekend with a Pink With Purpose Celebration Event. This is a FREE event but there will be opportunities to donate to Hawaii's HOPE LODGE, which is a tremendous organization that helps provide a home away from home for patients and their caregivers who are going through treatment in Honolulu. This event, is called PINK WITH PURPOSE and will be held on Sunday, October 15th at my home in Kapolei. 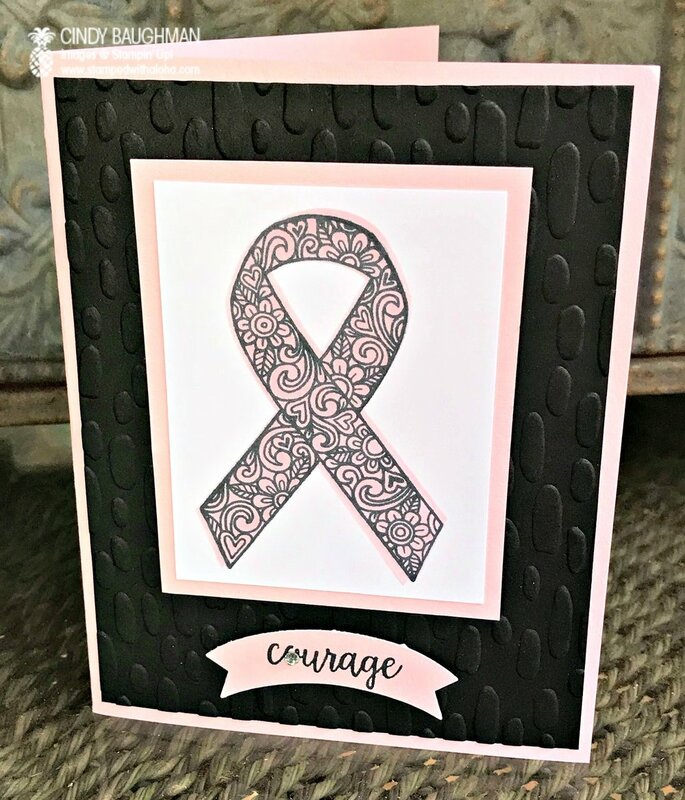 The Free Make and Takes have all been created from the lovely Ribbon Of Courage Stamp Set. This amazing stamp set and coordinating framelit was designed by Million Dollar Achiever Demonstrator Patty Bennett. Patty did an amazing job, it is such a beautiful set. Here are the projects I designed with the Ribbon of Courage stamp set and coordinating framelits. The Make and Takes are the two cards standing above. The post it note holder is a special gift of encouragment, given to anyone who attends who has battled cancer. Here is a close up of the projects. Basic Black and Pink Pirouette are the main colors of all three projects. This card featured the large ribbon stamp. This is actually a "two step" stamp, the pink color comes from stamping a solid ribbon stamp over the decorative ribbon stamp. The thing I love about this set is you can use it to make different colored ribbons for other occasions. I love the detail of the stamp, especially the beautiful pattern filled with hearts and flowers. Card number two is covered in hearts that display the same beautiful pattern as the ribbon stamp. 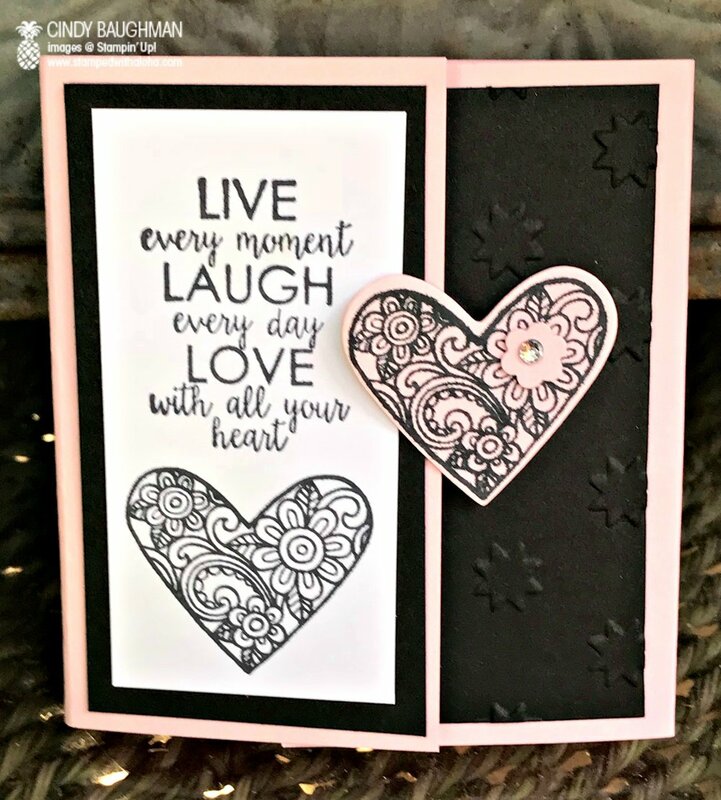 I chose to leave these hearts uncolored and instead add a pop of pink with the tiny pink ribbon accent that is used under the sweet sentiment. The post it note holder gifts we will pre make are very quick and simple to put together. Score it at 2 in, 2 3/8 in, 5 1/2 in. and 5 7/8 in. This holder stays closed by strategically placing the pink heart on the right side and lifting it up with a dimensional so that the flap gets stuck under the heart when folded. The inside of the post it note holders have bright pink post its and there will even be coordinating pens while supplies last. I will be co-hosting this event with two special friends who also happen to be Cancer Survivors. My friend Annie will be whipping up some light refreshments for all to enjoy. Something she does quite well. My friend and sister demonstrator Michelle will be joining me in assisting with the make and takes and both of us will have a lot of things to sell at our retired stamp sale. We are offering a 50% rebate on all retired products sold that day. All of us will be donating a portion of our commission on any orders that are placed at this event to Hope Lodge and we will have a donation jar should you want to make a donation to them as well. I realize I have a lot to celebrate and a lot to be thankful for. I hope if you are free on Sunday, October 15th, you will stop by and visit us. We will hold this event "open house" style. Drop by my home anytime between 10am and 2pm. Feel free to invite your friends, all are welcome. If you need directions or have any questions, please let me know. Email me at stampedwithaloha@gmail.com to let me know that you plan on stopping by so we can have a make and take kit ready for you.